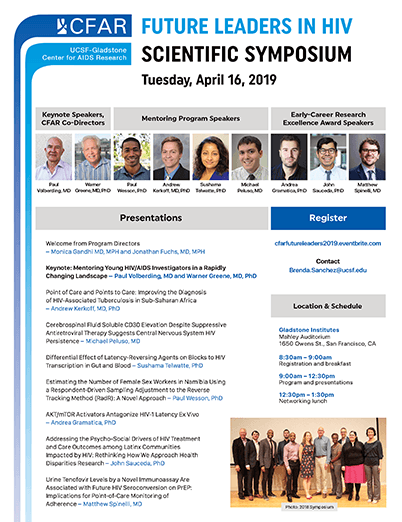 The Andy I. Choi Mentoring Program of the UCSF-Gladstone Center for AIDS Research offers Bay Area investigators a glimpse into the future of HIV research with a half-day symposium featuring the work of CFAR Mentoring Program participants and recipients of CFAR Developmental awards. Presentations will span a wide range of basic, clinical, epidemiologic, socio-behavioral, and translational science topics. The event also features the work of three outstanding early career investigators who will receive Early-Career Excellence in Research Awards in Basic, Clinical, and Behavioral Sciences. Gladstone Institutes is accessible via UCSF Shuttle (Grey, Gold or Blue) or you can drive and park at the UCSF parking lot on Owens Street.